Archaeological fieldwork begins with a non-destructive survey of the selected site or region for features or artefacts visible and invisible on the surface. 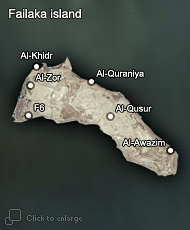 At Al-Khidr (and other sites on Failaka), visible remains have been mapped and surveyed and subsequently processed by means of Geographic Information Systems (GIS). The GIS for Failaka was built using the Kuwait Transverse Mercator (KTM) coordinate system. Primary information on the topography of the island was obtained based on 1:2000 maps from 1976 and was refined for individual sites by a combination of polygon method and detailed tachymetry. The following instruments were employed: Leica TC 405 total station, Leica Sprinter 100M digital level instrument, Kern level instrument, Garmin Etrex Legend GPS and ProMark3 GPS.